How to apply: "Since blemish has texture to it, you have to coat it and make sure it doesn't get too oily or irritated," says Dedivanovic. He says pencils are best for blemishes because it's pointy shape "allows you to go on the zit and around it easily." He recommends Urban Decay 24/7 Concealer Pencil, $18. Then take a damp sponge and powder over the area. 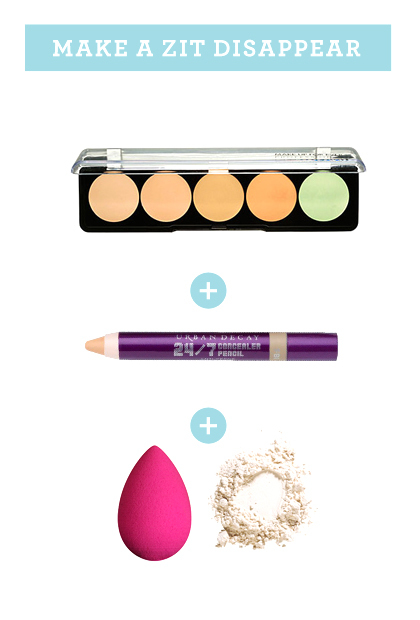 If your pimple is red, try neutralizing the color by using a green concealer first. We like Make Up For Ever 5 Camouflage Cream Palette in No. 1, $38.